Eschewing a conventional interface, you interact with Shnth using this wooden case and sensors. But note the USB port: from there, Shnth can use a deceptively-powerful programming language to make an array of sounds. Images courtesy the developer. 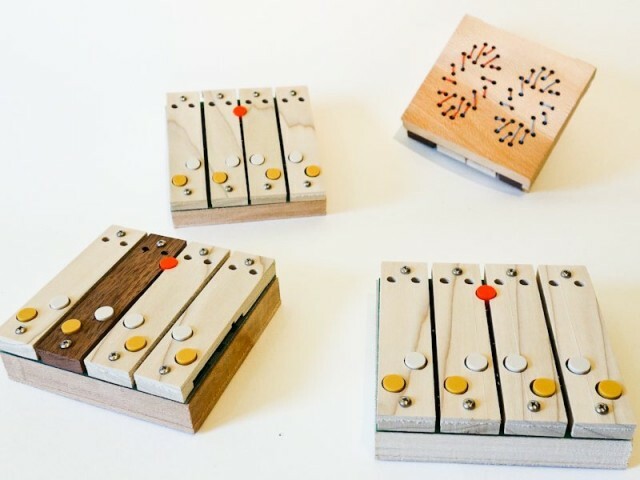 Shnth is a digital synth in a wooden box with a surprisingly open-ended programming language. 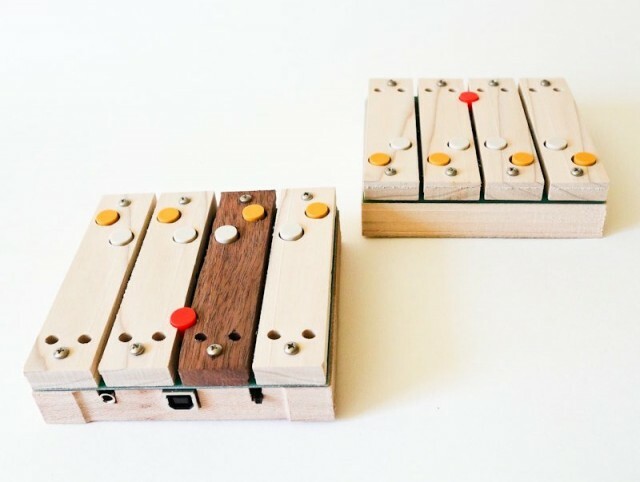 It’s like a lo-fi sonic computer, touched with your fingers via a handmade interface, and with sonic capabilities that can be re-programmed over USB. And there’s a coloring book to go with it, too, with pictures of Max Mathews and microsound for you to sketch in. The drawings there, like the sounds that come out of its outputs, full of rough, digital edges and unexpected swoops and swirls of timbre, seem to encourage coloring outside the lines. Peter Blasser of Baltimore is the synth’s creator and eccentric spokesperson. When he visited England earlier this year, the event was captured in a documentary. Those 25 minutes or so are just published, brimming with personality and wacky sounds. The Shnth Comes to England – with Peter Blasser from Rodrigo Constanzo on Vimeo. Instrument designer Peter Blasser, of Ciat-Lonbarde and Shbobo,came England in March 2013. He delivered a workshop at the University of Huddersfield on his latest instrument, the Shnth, along with its programming language, SHLISP. The Shnth is an embedded, ARM-based, digital synth, with built-in analog control. Event organized by Rodrigo Constanzo and supported by The University of Huddersfield. The Shnth, by Shbobo, is a computer music device that features the ARM Cortex M3 32 bit processor. It connects to host computer via USB, wherein the host computer (windows, linux, or macintosh) may read its “squish data” and create graphics and sound. Or, the Shnth itself is a standalone synthesizer, which may be programmed by host in the new language, “Shlisp”, by Shbobo. It is potentially self powered, by batteries, which are charged, again, via USB. A switch turns it on, and 16 bit sound comes out a standard stereo 3.5mm jack. Like a laptop; it is “handtop”. Four bars on top feel your fingers and two woven antennae below sense flesh, complimented by a battery of buttons. There are red lights. Type in your code using free tools for Mac, Windows, or Linux, and then the synth inside runs the results on the ARM CORTEX M3 as Assembly code. That coaxes every last ounce of processing power out of the chip. Exploiting the ARM, the resulting sounds can be quite beautiful, as if someone is stroking and plucking the digital chip itself. And past the funny names (butts and nuts? ), I imagine some sound hackers could actually rather enjoy the code. Everyone else may simply load up some code and see what happens. If you want to buy this box, it seems US$300 can turn into a Shnth of your very own. Thanks to Scott McLaughlin for sending this our way!